Supporters of the Sunflower Movement have organized sympathetic protests in Europe, North America, and Asia. The protests against a services trade agreement with Beijing that began with the occupation of Taiwan’s legislature on March 19 have now gone global. Student protestors, the backbone of what has now been dubbed the “Sunflower Movement,” organized a series of rallies around the world last weekend, with rallies taking place on Sunday to show solidarity with the major rally in Taipei on the same day. Organizers envisioned the series of protests as a “24-Hour Relay Across the Globe,” with protests beginning in Australia on the morning on March 30 and then unfolding around the world, with events held in Tokyo, Seoul and Hong Kong in Asia; Berlin, Paris, London, and Madrid in Europe; and New York City, Washington DC, San Francisco, Montreal and Toronto in North America. 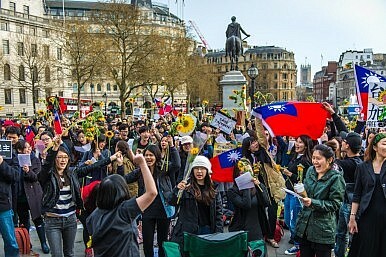 According to Taiwan’s China Post, activists in London and Berlin provided the initial impetus of the global protests, which ended up taking place in 49 cities spread across 21 countries. Protestors in the various cities reiterated the demands of the main Sunflower Movement in Taipei, including calling for a thorough reevaluation of the Cross-Strait Service Trade Agreement (CSSTA). While the worldwide protests couldn’t compete with the Taipei movement in terms of numbers, many of the protests had hundreds of participants. Taipei Times estimated that 400 people joined in the rally in New York City’s Times Square, with 300 present at the London and Berlin events and 100 protesting in front of the Taipei Economic and Cultural Representative Office (TECRO) in Washington DC. Taiwan’s government has also responded to the spread of the protests by having officials in European countries speak with students about the pact. According to the Ministry of Foreign Affairs’ Director-General of the Department of European Affairs Zhang Ming-zong, government representatives talked to students prior to planned protests in an attempt to dispel students’ doubts about the CSSTA. Despite these efforts, the overseas protests went off as planned. The global protests demonstrate that the issue of the CSSTA and its potential implications for Taiwan has touched a nerve even in overseas Taiwanese communities. The expansion of protests also indicates an urge by the Sunflower Movement to attract global attention. Protestors have been quick to plug themselves into global social media tools, creating a Twitter feed (with entries mainly in English), offering live video footage of the Legislative Yuan on Ustream (with commentary also in English), and even having protest leaders participate in a Reddit “Ask Me Anything” question and answer session. Despite their efforts, foreign media outlets have been slow to pick up the story. Headlines from the New York Times and BBC’s Asia coverage focused instead on the recent anti-PX plant protests in Guangdong. Continuing coverage of the search for Malaysia Airlines Flight 370 and the situation in Crimea has seemingly prevented media attention from focusing on the Sunflower Movement in Taiwan.